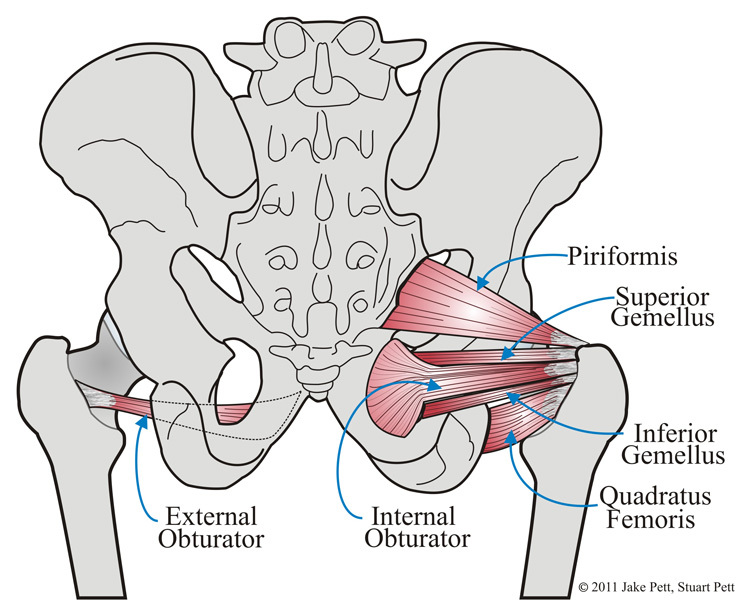 The deep six lateral rotators are a group of muscles that move the hip. Individually they are small, but together they are quite powerful. We covered one of the deep six lateral rotators, the piriformis, already. What do the names of the deep six lateral rotators mean? The names of these muscles refer to the fact that they work together as a pair. Gemellus comes from the word “geminus” which means twin or doubled, like gemini. Superior is Latin for above. Gemellus superior is found higher on the body than gemellus inferior. Inferior is Latin for below. Gemellus inferior is found lower on the body than gemellus superior. The names of these muscles describe their location. Obturator refers to the muscles attachment on the obturator foramen. Externus is Latin for outward. Obturator externus attaches on the outside surface of the obturator foramen. Internus is Latin for within. Obturator internus attaches on the internal surface of the obturator foramen. The name of this muscle describes its shape and its location. Quadratus comes from the Latin word quadrus which means square. The word femur is the Latin word for thigh. 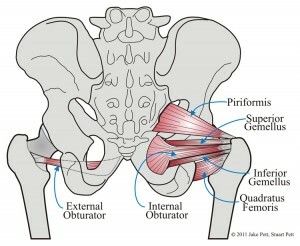 Quadratus femoris is a square-shaped muscle attached to the thigh. 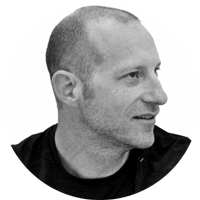 Where do the deep six lateral rotators attach? The deep six lateral rotators of the femur are located deep to the gluteus maximus. Gemellus superior and gemellus inferior originate together on the ischial spine. Obturator externus originates on the external surface of the obturator foramen. (The obturator foramen is a hole created by the bones of the pelvis.) Obturator internus originates on the internal surface of the obturator foramen. Quadratus femoris originates on the ischial tuberosities (sit bones). All of the deep six lateral rotators insert together at the greater trochanter, a bony bump at the top of the femur. 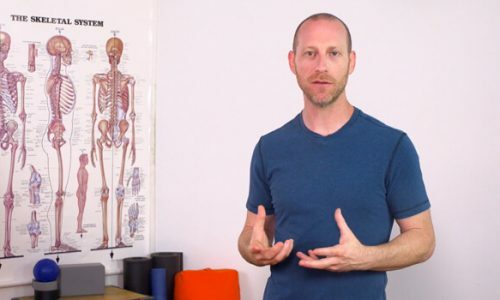 What actions do the deep six lateral rotators do? The deep six lateral rotators have a common action, lateral rotation of the thigh at the hip. The quadratus femoris can also assist in adduction. The deep six lateral rotators contract in urdhva dhanurasana. But don’t let them overpower the adductors! The double pigeon is a great place to lengthen the deep 6 lateral rotators. Flexing and externally rotating the hip joint will lengthen these muscles. This little series is my favorite for getting into some of these tissues. 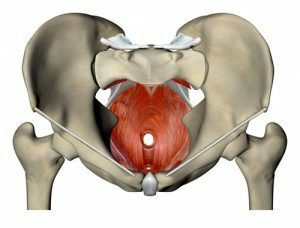 If I rotate too much my hip (external rotation) and get a back pain, will my psoas muscle affected? 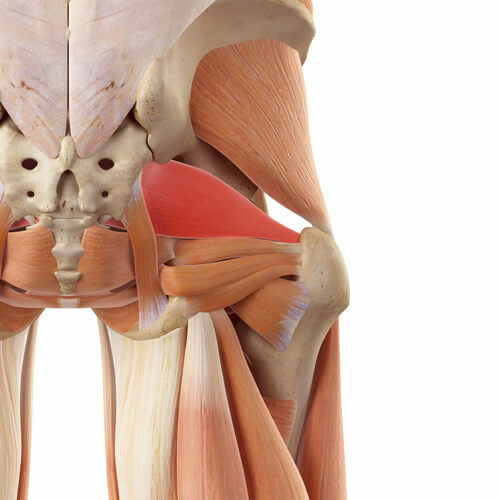 Will my psoas muscle becomes weak? Is it because of the hip flexion mainly that the lateral rotators strech when you do lateral rotation? I whuld think that they are streching while you do internal rotation.. can you please shed some light on that?